Genetic disease in dogs is devastating. Every year, uncounted dog sport competitors and their families are heartbroken when their beloved companions are crippled from hip dysplasia, go blind from progressive retinal atrophy, die of subvalvular aortic stenosis, or suffer from many other disorders. Many of these tragic incidents could have been prevented with proper genetic testing before breeding and/or screening of the puppies. Responsible breeders do this; irresponsible ones do not. By conducting thorough genetic screening programs, responsible breeders can greatly reduce their chances of producing an affected puppy. However, myths about genetic testing still abound. Myth: My dog jumps off the dock all day. The vet says he’s never seen a healthier dog. There can’t possibly be anything wrong with him. Fact: A dog can appear perfectly healthy but be genetically unsound. Well-muscled dogs may not show signs of their hip dysphasia until their sockets have eroded to nothing. The first symptom of subvalvular aortic stenosis in some dogs is sudden death. Dogs with mild retinal dysplasia that doesn’t affect their vision can produce blind puppies. The only way to ensure these dogs really are healthy is testing. Most vets are not experts in canine reproduction. They also may not want to lose business by telling their clients not to breed. In addition, a breeder may hear only what he wants to hear, not what the vet actually tells him! No vet can tell that a dog is free of genetic disease just by looking at the dog. Most genetic tests require special examinations by qualified veterinarians. Your best bet is to know what genetic tests are needed for the breed that you are interested in, and find out how they are administered and what the results mean. Myth: Only conformation show breeders need to do all this testing. It really isn’t important for pets, or dogs that aren’t going to be shown. Fact: The most important job that any dog has is to be a good pet! 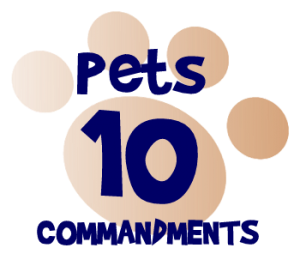 There are several qualities that a dog needs to have to be a good pet. It should be healthy and well-socialized (to children, other people, and other animals). In addition, it should grow up to look and act like what you would expect of a dog of that breed- after all, you chose a breed based on the characteristics that it should have. A Golden Retriever puppy should grow up to be a 70-pound, easily-trainable retrieving maniac that loves everyone and can play all day. It should not grow up to be a 120-pound dog that fights with other dogs, hates kids, cannot be housebroken, and refuses to retrieve. If someone simply breeds two unevaluated Goldens together, the offspring may not look or act like a true Golden should. If these offspring are bred to other unevaluated dogs, pretty soon you will have dogs that are Goldens in name only but that look and act nothing like a well-bred Golden Retriever. In addition, anyone who buys a dog as a family pet wants to ensure that the dog is healthy. Responsible breeders will ensure this by doing the proper genetic testing to ensure that the parents of their puppies are healthy. Less reputable breeders are unlikely to know that such tests exist, let alone do them. Myth: My dog has had all his genetic tests.. That’s enough to show that his line is healthy. Fact: While it’s a step in the right direction, it isn’t enough. Let’s give one example. One Lab gets an OFA rating of Excellent.. Another Lab receives a rating of Fair. Which one has better potential as a breeder? It seems obvious that the one rated Excellent is better…but what if you know more of the story? What if the Lab rated Excellent comes from untested parents, and several other of his siblings are dysplastic, but the Lab rated Fair comes from parents rated Excellent, and all of his siblings are rated Good or Excellent.? Now the dog rated Fair is the better choice. The moral of the story is that test results aren’t everything. In the case of some disorders, particularly polygenic ones like hip and elbow dysphasia, pedigree analysis is also vital. In the case of diseases like progressive retinal atrophy in Labs and Chesapeake’s, where a DNA test is available to determine whether a dog carries the gene for a disorder, even if he is not affected with it, test results can determine what dogs a tested dog can safely be bred to. A Lab that carries the gene for progressive retinal atrophy, for example, can safely be bred to a Lab that doesn’t carry the gene, but then all offspring must also be tested to determine if they are carriers of the gene or not. In the cases of disorders that have a dominant mode of inheritance (thus any dog with the “bad gene” will be affected), like retinal dysplasia in Labs, decisions are simple- no dog affected with the disorder should ever be bred. Myth: All this testing is so expensive. How will I ever make money off this litter if I do all this testing? Fact: Well, I’ve got news for you…responsible breeders rarely make money off of a litter, and don’t breed just to get cash. When you add up all the costs of responsible breeding- all the health testing on sire and dam, competing in whatever venue you’ve chosen to determine that your dog is breed-worthy, raising the litter properly- you’ll be lucky to break even. Responsible breeders breed only to produce happy, healthy puppies that can grow up to be what their breed is supposed to be. Myth: I am looking for a working dog. They don’t need all those health clearances. Fact: Yes they do. A working dog needs the health and stamina to run and perform all day. Don’t buy this excuse. Myth: The puppies I’m looking at are AKC-registered, so they must be healthy. Fact: The American Kennel Club is only a registry. AKC registration does not guarantee you a quality puppy any more than DMV registration guarantees you a quality car. Hopefully, this article has helped dispel a few myths. We all want to live in a world where every dog is a wanted, healthy dog- and genetic testing of all breeding stock is an excellent step in that direction.